Installing AxCMS.net to a developer workstation. We assume that you do not change any default values proposed by Axinom. Thanks to AxCMS.net 9 now it is possible to install it just in one step! Just run the downloaded AxCMS_Sample.exe file package (Right click - run as administrator)! It will extract all the files under the default AxCMS directory C:\Projects\AxCMS_Sample and will run Install.bat file. Please ensure you have installed ALL components listed and your system settings are compatible with automated installation, otherwise AxCMS.net could not work or install could fail! More about this subject you'll find in the System Requirements section. 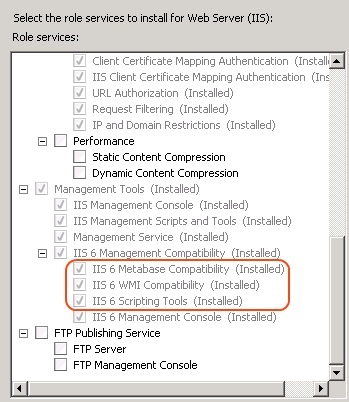 Allow SQL Server Authentication in your SQL Server. Go to properties of your SQL Server in SQL Server Enterprise Manager, Security, Authentication and turn on "SQL Server and Windows Authentication mode". If it is set to "Windows only", AxCMS.net will be unable to login to SQL Server. If you have SQL Express installed to default instance (not to MSSQLSERVER), then you should change all the connection strings in config files from (local) to LOCALHOST\SQLEXPRESS under the AxCMS_Sample\Resources_Sample\Configuration\SampleDEV folder. The same with Configuration.build file under AxCMS_Sample\Resources_Sample\Deploy. Find there (local) word and change it to LOCALHOST\SQLEXPRESS. If you have 64 bit OS then use Framework64 directory instead of Framework. 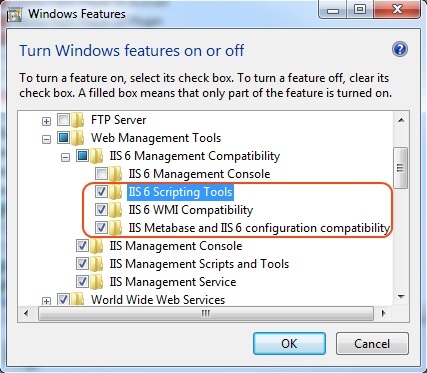 You should add IIS6 Scripting Tools and ASP.NET under the Turn Windows Feautures on or off (in Windows Vista / 7) or under the Add Role Services (in Windows Server 2008 / R2) otherwise create scripts would be unable to create the Virtual Directories. Components - AxCMS-Resources, Docs, DB-Scripts, etc. Each AxCMS.net-Application needs its own configuration file. Sample configuration files are already included in C:\Projects\AxCMS_Sample\Resources_Sample\Configuration\SampleDEV\ folder (for Management System, for Live System and for Publish Service). If you have to change something, please ensure that you change it in all configs. Please, run PostBuild.bat (located at C:\Projects\AxCMS_Sample\Resources_Sample\Deploy\) each time you change configuration files. It copies configuration files to proper places. To start AxCMS.net you have to provide a valid license file. You can request the license file from Axinom for free. 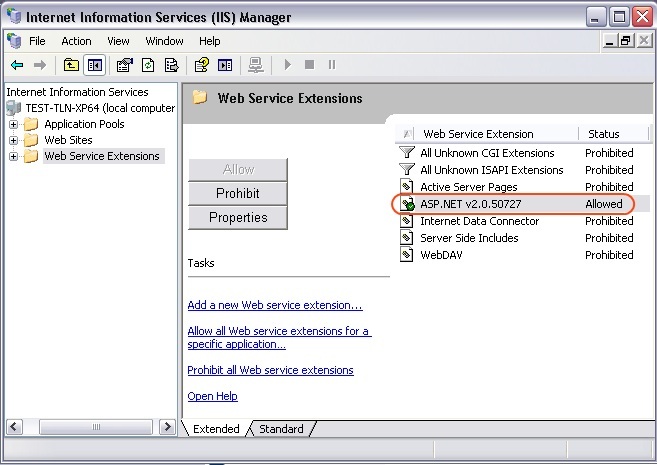 Copy the license file received into any folder (preferably not accesible through IIS) and put this path into web.config's of the Management System and Live System (key GlobalLicenseFile). LiveSystemHostName key in the web.config must match the URL in your license file. More about this subject you'll find in the Licensing section. You get a login screen from AxCMS.net. At the bottom of the dialog you see the version of AxCMS.net. You can login into the new installed system with axinom / axinom. Note: You are advised to immediately create a new user with another password, give it administrative rights and take away rights and roles of axinom-user. Under no circumstances run production instances of AxCMS.net with axinom-user available. If your system works, you can install and configure additional modules. Double click on the solution file (located at C:\Projects\AxCMS_Sample\AxCMS_Sample.sln). NOTE: Maybe your VS does not recognize some projects - if it does not recognize a single one, then you need to install SP1 for Visual Studio, if it only does not recognize UnitTest_Sample project, then your VS does not support the test projects. You can simply delete that project. After each build, you have to run the PostBuild.bat located here: C:\Projects\AxCMS_Sample\Resources_Sample\Deploy_Sample\PostBuild.bat. It copies created dll in right bin-directories. At the moment this is configured in Post-Build event of UnitTests project as this is the last project that is built in solution. If you just deleted UnitTest project, you can add post build event to Sample.BL in properties of project/Build Events/After successful build -> then enter path to PostBuild.bat there.